DUNCAN MAITLAND (with Pugwash) "Lullabies For The 21st Century" last copies on vinyl here! 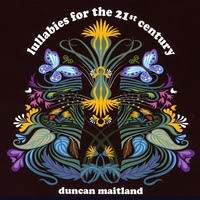 DUNCAN MAITLAND "LULLABIES FOR THE 21ST CENTURY" (SUGARBUSH SB017), only 250 copies on coloured vinyl! £18.99 inc. postage. Ex Pugwash man Duncan Maitland sees his legendary album released on vinyl for the very first time. Featuring members of XTC, DIVINE COMEDY & PUGWASH this is a fantastic 60s tinged album of melody, harmony and brilliant playing. A review in "Powerpopaholic" sums it up thus:"Dublin native Duncan Maitland is joined by an all-star guest line-up on his smashing debut Lullabies for The 21st Century. Colin Moulding from XTC plays bass on the opening track, and also helping out are Fran King, Barry O'Brien, Keith Farrell and Tosh Flood (Pugwash). Recorded at his in-home studio, the album draws influences from many favorites. Starting with the richly melodic "Your Century" it has glowing background harmonies and driving bass line. Followed by the flowing narrative of "Terry The Toad" it adds a great hook in the chorus, and "Crash Position" is a perfect example of modern Beach Boys pop, similar to Rick Gallego (Cloud Eleven). These songs are not simple ear candy, but complex pop symphonies that don't rely on a straight formulaic approach. Every song on the album is a meticulous study in pop smarts from the Beatlesque touches of "Alien At Home" and "Horror Stories" to the wistful atmosphere of "Supermarket Dream." PUGWASH "ALMANAC" on orange or white vinyl, LAST COPIES!! Get them here.